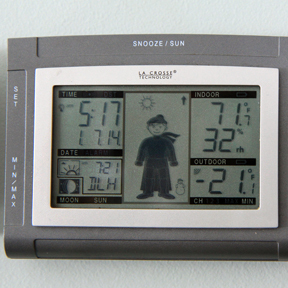 I’ve got a wireless weather station on my wall that gives me all sorts of stats. Humidity, sunrise, sunset, moon phase, and naturally, temperature – indoor and out, high and low. But really I get all the information I need from the little fellow in the middle of the LCD display. Weather Boy. He sports a range of weather dependent wardrobe options, from swim trunks to full winter regalia complete with scarf and hat. Anything below freezing and a snowman appears by his side. And that’s all I need to know. I probably don’t need to tell you that Weather Boy has been in the company of his snowman ALL winter. 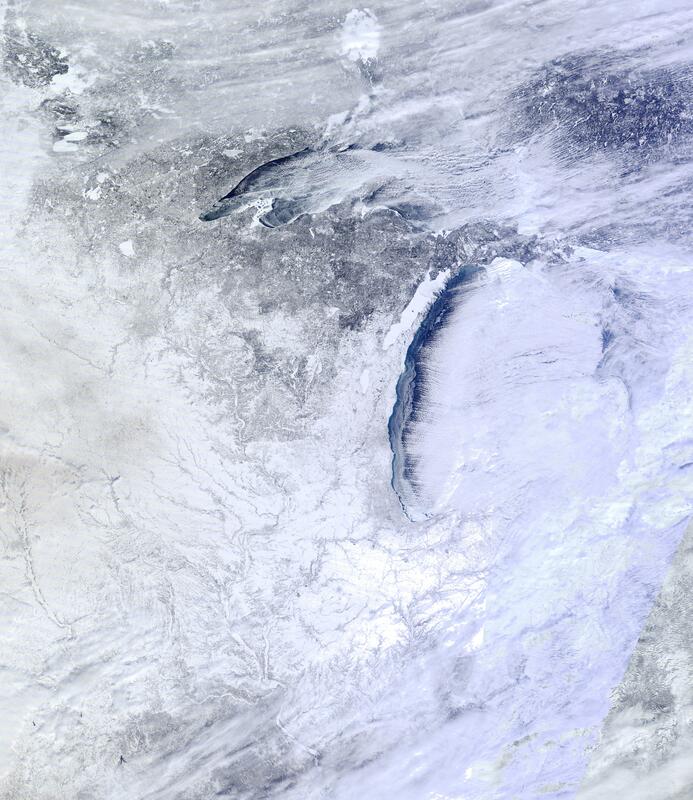 Polar vortexes, arctic blasts, record setting wind chills – it’s been one wicked winter. Last time I checked, Lake Superior is 93% frozen and is on track for a complete freeze over. This hasn’t happened for 18 years. And it’s been 20 since we’ve had a January as cold as this one was. Earl has set a new personal best for taking care of his daily business. I haven’t ventured out to check on my sweet little bees since December – partially because of temperature and partially as an exercise in letting go. One of our backyard treasures – the Apostle Islands Ice Caves – has gone viral, generating throngs of people that (for me at least) dilute the magic of it all. The woodshed is frighteningly low. Propane is hovering at $5 per gallon. Despite all this, there is one thing that delivers solace. Cabbage. I am rich in cabbage. No matter how bad it gets, there will be cabbage. Is it worrisome that I’ve been channeling the pioneers and early settlers? They survived much worse – quite possibly without cabbage. So I consider myself lucky. It’s difficult, in all this snow and cold, to accurately recall the garden, but my cabbages help remind me. Last summer boasted perfect conditions for late season greens. I loaded up our make shift root cellar this fall and have continued adding to it with cabbages from our Hermit Creek Farm winter CSA share. I pull one out about once a week. That’s the beauty of cabbage, it’s durable. Even a tired, slightly slimy cabbage can be revived by peeling away a few outer leaves. I must not be the only one with a cabbage surplus. I’ve overheard an unusual amount of cabbage dialog this winter. My aunt Lynn turned me onto a bright tangy slaw from the original New York Times Cookbook with caraway, onion, mayo, and plenty of lemon juice. When my friend Ann saw Mollie Katzen’s latest Heart of the Plate, on my shelf, she raved about the peanut coleslaw – tenderized cabbage with a savory peanut sauce. And the always inspiring Mary over at the Cookery Maven motivated me to make my first ever hot and sour soup – cabbage based, of course. But it’s awfully hard to beat plain old chopped cabbage sautéd in a little butter with onion, salt and garlic. Add a thinly sliced potato for bulk, a pinch of caraway, maybe a fried egg over the top and you’ve got a stick-to-your-ribs winter meal any homesteader would be proud of. And I’d argue it’s nearly impossible to top roasted cabbage. Far too late in life I discovered the glorious things that happen to cabbage when it meets a hot oven. It turns melt in your mouth soft and takes on a rich, caramelized sweetness. 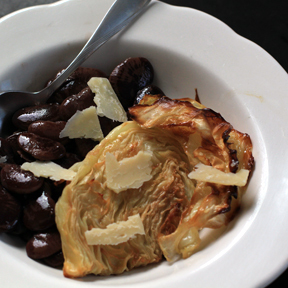 Even non-cabbage people tend to like it – trust me on this, you non-cabbage people. Roast cabbage can be served in any number of ways, but my favorite – like most things – is to keep it simple. I love a big spoonful slopped alongside of a bowl of warm beans. Good Mother Stallards are my choice, but any dense meaty bean works. Sprinkle a little shaved Parmesan over the top, pour a glass of wine, and cozy up to the fire. Winter never looked so good, despite what Weather Boy has to say. Peel away any tired outer leaves from the cabbage and remove the core. Cut into even slices, about 3/4-inch thick. Lay slices on a baking sheet and rub with olive oil, salt and pepper. Roast in a 400º F oven for about 30 minutes, turning one half way through. Try and keep the slices intact when you flip them. 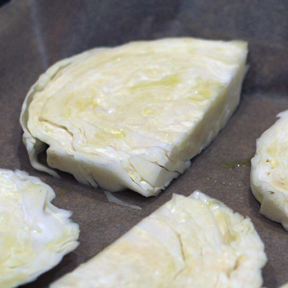 Remove form oven when cabbage is slightly browned and has a few toasted edges. Thanks Missy – I’m glad (and have to give credit to the cabbage for inspiring me). Yum! Sounds divine. Thank you. I have a friend who has a nice comfort food recipe for cabbage as well. Just sautee onions and cabbage with a bit of butter/oil and after the house is filled with delirious aromas, pour this lovely skillet of goodness over a plate of steaming egg noodles. Will win no color wards but really satisfying in a grandmotherly kind of way. Am for sure going to try toasting cabbage. Ooh – I like the egg noodle combo! Maybe some red cabbage for a little color splash? You are reading my mind Jill. I just happen to have both red and green waiting for my latest cooking inspiration. Thanks Jill! I so love you, your writing and cabbage as well. We learned to have our “root cellar” in the back room of my studio which, when I am not firing a kiln, stays at about 40-45degrees. We have been able to grow and keep more cabbage, potatoes, brussels sprouts and onions because of this. I welcome ANY cabbage recipes. Thank you. p.s. Is this really going to be a snow storm? Seems kind of pooty to me. Oh, and thanks for the link to the Rancho Gordo site. I love beans and the Good Mother Stallard look delish. Aw – thanks Pat :-) On the beans – those are actually Christmas limas – another favorite. But I LOVE Rancho Gordo – their beans are super fresh and amazingly good. I have found them in the cities, but not around here – unfortunately. Cant wait to try roasted cabbage since I enjoy it many other ways. I was thinking of you when I saw the news stories on the Ice Caves and was wondering if all those people were tramping through your back yard. Great idea to use the red for a splash of color. Love to grate red cabbage over summer salads and also use for kraut. Gorgeous!